Pottery Wheels for Beginners: A buyers Guide. Are you thinking about buying a Pottery Wheel, but are unsure which Pottery Wheel you need as a beginner? Then read our guide on Pottery Wheels for Beginners! Pottery Wheels: What are they? Pottery is art that can be traced back up to around 29,000 BC. It's beginning purpose was solely for utilitarian purposes when clay pots and cups were made for drinking, eating, and cooking, using what they found in abundance; water, and clay made from mother nature herself. The practicality of pottery is one of the main attractions. However, producing something durable and beautiful from a pile of clay is very intriguing. Before the pottery wheel was invented, the technique potters used to form their wares was hand-building / coiling. Once the pottery wheel was invented (sometime around 1,300 BC), the process of creating ceramics was faster and took a lot of the hard work off the potter's shoulders. Advances in the pottery wheel have made the potter's job even easier, allowing you to effortlessly create beautiful and functional pieces. What type and brand of pottery wheel should I invest in? Where do I buy a pottery wheel from? and, what is the initial investment? Investing in a potter's wheel as a beginner can be very intimidating. It is such a large cost, and really the turning point from when you start to take your pottery hobby seriously. For the very high-end wheels, you can easily spend thousands without blinking an eye. But for good home-studio quality, expect to pay around $650.00. The difference in price depends on your needs, the area in which you intend to work, and of course, your budget. There are basically two types of pottery wheel; the kick wheel, and the electric pottery wheels. So which pottery wheel is right for you? The electric pottery wheel is the normal entryway for home potters. They are easy to control, easier to center clay with, and are more compact. By not being in a permanent studio, you would want to buy an electric model simply because the electric wheels are lighter and smaller than kick-wheels, and so you can move them around easily when needed. There are various sizes of electric pottery wheels, from small table-top units, to fully kitted out wheels with splash-pans and work surfaces built in. Taking proper care and continuing maintenance, an electric model should last you up to 10 years or more. Kick-wheels are bulky and cumbersome. Once it's in place, odds are you won't move it, so be sure the area you decide to place your new toy in is a permanent spot. These types are not only heavy but they are almost impossible to move. The kick-wheel may not require electricity but you will be required to use your leg muscles, a lot. You do have to kick it after all! Literally. 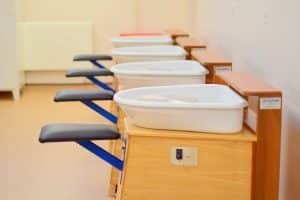 While there are potters than claim this technique is relaxing and soothing, it can certainly cause knee or arthritis issues. You don't need much force to work with a kick-wheel, but will be doing repetitive, continuous motions which may aggravate some users. On the flip side, kick-wheels are durable and trustworthy. There is very little maintenance and should last your entire lifetime. Whether you kick counterclockwise or clockwise, you will be able to throw comfortable no matter if you are right-handed or left-handed. There are kick wheels that have motors added to them, which helps getting the flywheel up to a proper speed. If you are just beginning to get into pottery, the "Speedball Artista Pottery Wheel" is a great choice to start with. 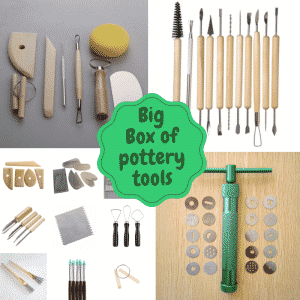 It can be found for around $400.00, which is still a huge investment for the novice potter. The Speedball Artista Pottery Wheel has a 1/3 HP motor which runs smoothly with very little noise. It also has a variable speed hand control (0-220 rpm), which means you can center up to 25 lbs of clay. The 11" wheel head comes with 2 bats for free. This portable, tabletop model has space for two 2.5 quart buckets and makes a great trimming station. The Artista features a variable speed hand control, high-impact plastic and steel frame construction and is available in left or right handed wheel hand drive models. Skutt makes a really good kick-wheel. It uses a Bolt-Together construction which makes it really easy to take apart and move around. The heavy flywheel is cast of cement in special forms that ensure balance. It rides on a very heavy duty, very smooth bearing which makes kicking almost effortless. The specialized cement mix used to make the flywheel creates a very dense and durable wheel that has the mass necessary to keep the wheel spinning with minimum kicking. On optional motor assist can be added to limit kicking all together. Bolt-together construction allows you to assemble the wheel in place, eliminating the difficulties of transporting the wheel up or down stairs or around tight corners. The frame is made of heavy gauge galvanized tube steel which provides excellent resistance to rust and a very stable platform to throw from. The seat on the Skutt Kickwheel is adjustable both up and down and front and back. The foot rests are also adjustable to fit your body. Special cement flywheel on a very smooth heavy duty bearing. Purchase the optional Bat Mold System and you can make your own plaster bats. Another potter wheel designed and priced to sell is the Speedball "Clay Boss". For under $700.00 you can purchase a sturdy, load-sensing wheel that maintains the speed for you. It is highly recommended for those potters just beginning, who want to throw larger items. 14" cast and machined Easy Clean wheel head-- includes removable bat pins & 2 free bats-- 12" and 7"
Pedal equipped with "Cruise Control"
A Mini Pottery Wheel is more for fun than actually producing lots of work. They are way less expensive than a normal sized pottery wheel, but they are still just as much fun 🙂 With a Mini Pottery Wheel, you can create mini pots! 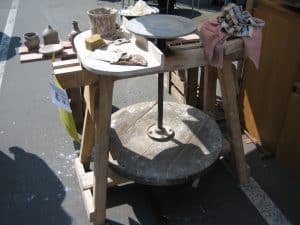 If you are looking to purchase a pottery wheel for beginning to throw at home or in your studio, then there are loads of options available for you. From small & portable table top units, to heavy kick-wheels that just keep on turning, the choice is ultimately up to you. 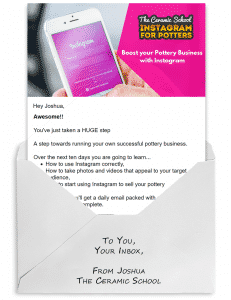 The best advice is to take pottery classes in order to learn all the fine print to becoming a potter. As mentioned above, you can easily find yourself investing a great sum of money of an item you may not be prepared to operate. Education is the key. Do plenty of research as to the types and styles potter wheels come in. Most of all, enjoy your new hobby. If you are planning on buying a used pottery wheel, then read our guide on purchasing used pottery wheels & what to look out for.